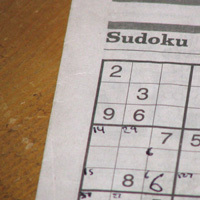 Sudoku is a game of pure logical deduction, just like Kakuro and other Japanese number puzzles. Unlike games of luck such as card and bingo games, guessing is never required. I’ve now learned a number of methods for solving tough Sudoku puzzles by hand, including X-Wing, Swordfish, Jellyfish, Squirmbag, Turbot-fish, XY-Wing, XYZ-Wing, Conjugate Pairs, Bowman Bingo, Simple Coloring, Super Coloring and Tabling. I have not yet found a single website that explains all of these techniques in one location, so I thought I’d provide some links to the various websites where I discovered these techniques. The first 6 methods listed on Sadman’s site (Naked Single thru Hidden Subset) are sufficient to solve all the “Easy” and “Intermediate” puzzles I provide on this site, and most easy/medium newspaper puzzles. Although the XWing (and Swordfish) patterns are easy to spot, statistical analysis shows they do not occur very often. I’ve found the XY-Wing and XYZ Wing patterns occur much more frequently, and are good weapons to have in your solving arsenal. These strategies are especially good for solving the super tough puzzles I offer here. I find the various coloring/colouring and tabling methods to be too work-intensive for human use – they really make more sense for computer solvers, but sometimes they are the only methods you can use to solve a really hard puzzle. Finally, Michael’s Mepham’s Book of Sudoku contains an excellent 10-page introduction with various solving strategies, in addition to numerous puzzles. UPDATE: Eduyng CastaÃ±o wrote to me about a technique he has discovered called Golden Chains (pdf). The technique is a generalization of XY-Wing, and solves many of the same puzzles that can be solved by other advanced techniques such as conjugate pairs, and coloring, but it does not feel as much like ‘guessing’ as those other techniques. I have successfully used it to solve a number of my ‘super tough’ puzzles. It is particularly effective when a puzzle has been reduced to a lot of squares containing only 2 possibilities. This entry was posted on Thursday, September 29th, 2005 at 12:17 pm	and is filed under Jim's Projects, Puzzles. You can follow any responses to this entry through the RSS 2.0 feed. Both comments and pings are currently closed. Great guide to Sudoku! Well done! Thanks for this references. I will translate and update my own website with those techniques. Maybe I just don’t understand the definition of “buddies”. In your example, you write that in figure 4, r1c1, r1c2, and r2c9 are “buddies” of the first and last cell of the Golden Chain. But, r1c2 contains a 9 as the correct answer. Please explain just what a “buddy” is. At what point does reverse engineering fail? I just fill in all numbers missing from a 9-square, then further subtract numbers existing in rows across and then again down. This usually leaves you with at least one single number, and then you can begin subtracting again. Most (80%) puzzles solve this way. The ones that don’t are the ones with two pairs which force you to choose one of the pair (guessing) and then go from there. You have a 50% chance of solving your first try. Then there are the really tough ones that don’t even give you that option and I have not determined any way to solve these. I.e. the “insane” ones this blog site offers. What I would like is a simple way to solve these; any secrets or is it just guessing again? I will cross these off my list if it’s just gessing; takes all the fun out of it. Some of the ones that you are currently solving using guessing don’t require guessing – e.g. you can use XY Wing or other strategies instead of guessing. However, the insane ones on this site do require some guesswork. For more strategies in one place, try http://www.sudoku-strategies.net. I am very new to Sukoku, but am already addicted, and have fairly quickly gotten to where intermediate puzzles are no huge challenge. I’ve been working on a hard one, and gradually have made headway, as I have begun trying to master some of the various techniques. But I got totally stumped just a few steps short of the point at which everything solves easily. I refuse to guess or try to play an extended option to see if it eventually causes a contradiction, because what’s the fun or challenge of that? So, I was totally thrilled to stumbe on this website, with its link to the website for learning Golden Chains. I was at the point of a large number of the kind of cells with just two options remaining in each that the technique uses, and sure enough, I found one Golden Chain that unlocked one cell, and the puzzle was trivial from there. Thank you, that was just the technique I needed. Copyright © 2019 Jim Bumgardner. All Rights Reserved.